Paracord is a very versatile form of cordage originally manufactured for parachutes. 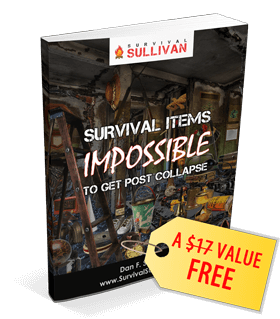 It was a special intertwined rope made for the lines of suspension on the chute, but now it is so dynamic that it is used in almost every form of survival and post collapse BOB and kits. It is so strong that it was used to repair the Hubble Space Telescope by astronauts, as it was deemed to be that strong in tensile strength. The most common weight to break the cord is 550 pounds, so some call it 550 cord. 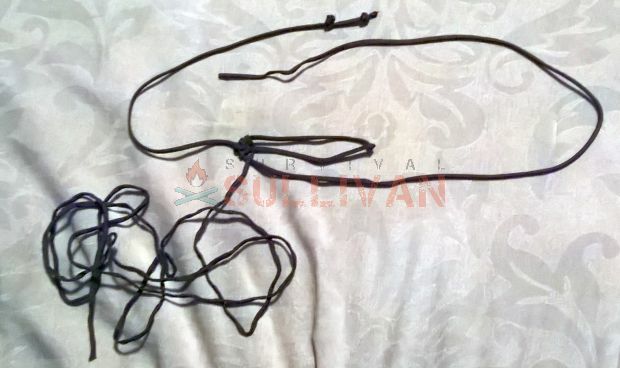 It has 5 to 9 strands encased in an all nylon sheath, with each of those made up of 2 (commercial) or 3 strands (mil-spec). This configuration makes it smooth and elastic, and very utilitarian. There are cheaper lookalikes made of polyester, but the US made standards that true paracord be made with nylon. 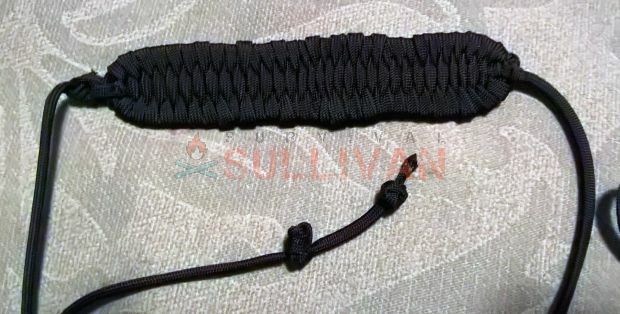 The military grade is heavier as the core strands are nylon also, not just the outer sheath as with commercial grades. Military grade is black or green, but commercial colors come in any shade now including glow in the dark, reflective, and zombie shades. There is a nice and easy weapon you can fashion from paracord that dates back to the Upper Paleolithic age. One of the many uses for paracord if you are in the woods is to make yourself a sling. It is mentioned in almost every continents history for weapons and hunting through the ages, and is still used to this day. It is the sling, and what it shoots are referred to as “sling bullets”. A person who uses a sling is a slinger, some cultures call it a shepherds sling. It was used in combat as well as hunting and is woven into the Bayeux Tapestry and has its place in the Spanish Civil War to pelt their enemies with grenades on the other side! 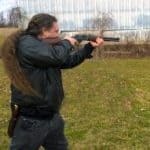 But more commonly the projectile is a clay bullet, a stone, or some hard item released when the sling is swung into an arc, and the centrifuge motion projects it forward. Do not let it fool you for looking so simple a thing, they are pretty accurate and can inflict quite a bit of damage. 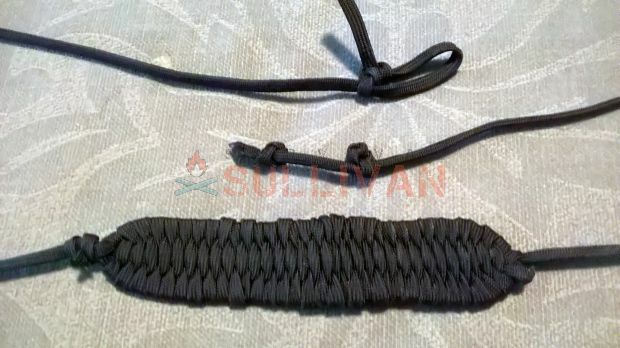 That’s why they are ideal to make with paracord as an improvised weapon for survivalists and lifestylists. They are inexpensive and light weight, and can be made quickly to get some food on the table if need be. 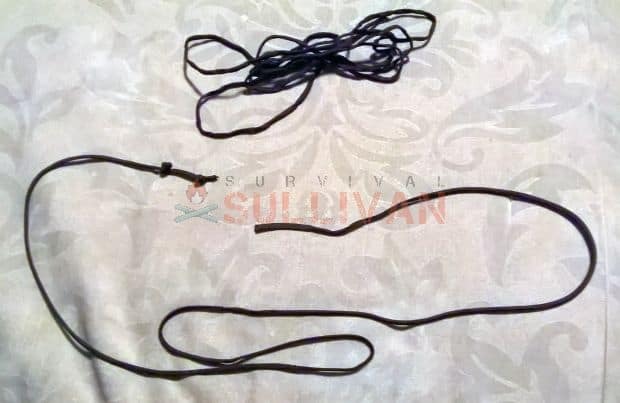 The sling can be used to take small game if you are ever out in the woods, whether or not you are there intentionally or if you have become lost. You can make yourself a really good sling from paracord. All you have to do is a little weaving and follow these step by step directions. 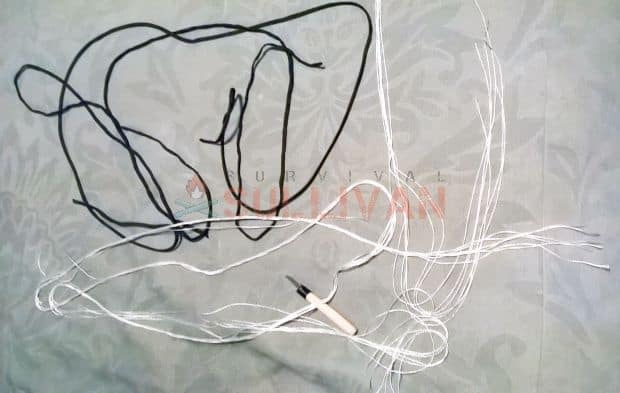 STEP 1: The first thing you have to do is cut a length of paracord six feet long, and a piece of paracord eight feet long (or a little longer). Then pull all of the inner strings out of the outer sleeve. STEP 2: The six foot piece will be the sling, and the longer piece will be the weaving to create the sling basket. You take the six foot piece and create an “S” in the center. STEP 3: Then you tie one side of the “S”. STEP 4: Then you take the longer piece and tie it to the closed end to begin the weaving. 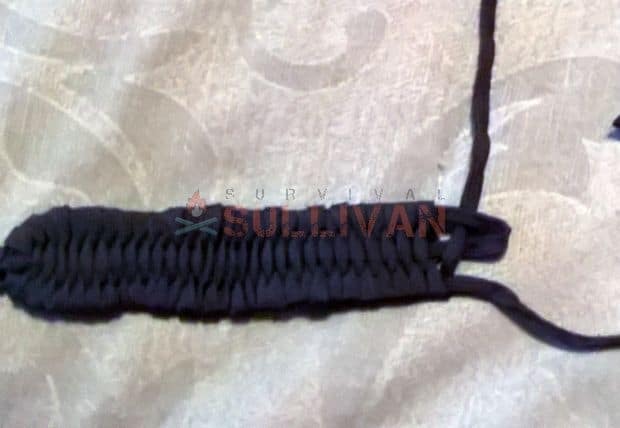 STEP 5: The three lengths of paracord that make the “S” are the horizontal runs of the basket; the longer piece is used for the vertical runs of the weave. 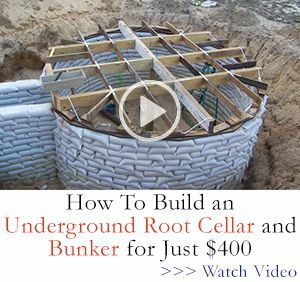 So you just weave in and out, over and under, going around the outside of the outer horizontal runs. The picture below shows the basket about half way completed. STEP 6: Just keep weaving until you get to the end. It takes awhile. STEP 7: Then loop the free end back through the opening of the “S”. 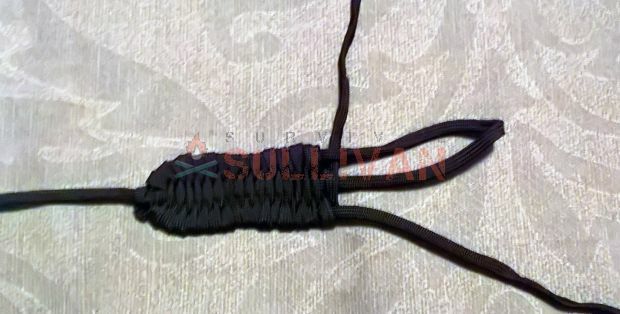 STEP 8: Then you tie off the vertical run cord to the free end of the “S”, which will be one of the ends of the sling. Pull all the ends tight. STEP 9: Once the basket is woven all that’s left to do is tie a slip knot on one end to go over your index finger, and then tie a couple knots in the other end to grip between your index finger and thumb. 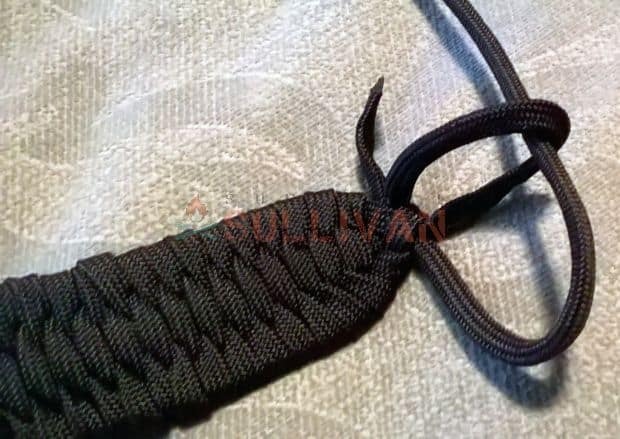 STEP 10: You now have your completed sling made from paracord. To use the sling, slip the knot over your index finger. Then grip the knots on the free end between your thumb and index finger. Place the stone in the sling and then start swinging it up over your head. After a few rotations, give an extra “fling” as you point at your target with your index finger, releasing the free end at the same time. Yes, it sounds pretty easy, no, it isn’t easy. It takes practice. A lot of practice, I know how to make and swing a sling but as for hitting a small target, well, not so much. But, I’m sure that if I was trying to get food, sometime eventually after a LOT of tries I would get something. Of course, practicing at home on those days when I just have nothing better to do could probably remedy that somewhat. A few strategically placed soda pop cans and a pocket full of perfect stones and I’m sure I could get there. Originally for airborne units as mentioned, paracord is used for almost any military operation that needs lightweight cord. If a slightly less elastic cord is needed, such as for a bootlace or to sew, you can take the inner fibers out and use them. They will fray and you need to melt the ends to crimp them. Since the military introduced it, so many fakes and poor reproductions have come on the market you need to know what to watch out for. 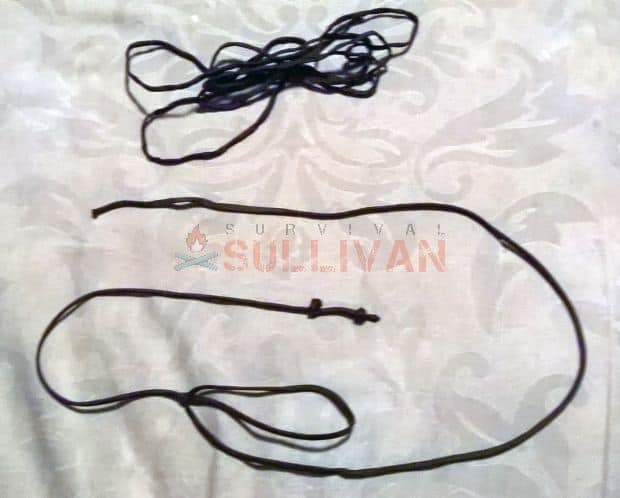 If you are going to the trouble to pack supplies and gear, using subpar line can be devastating as it is used for so much from fishing, lashing, traps, scaling, etc. Look out for thicker inner core lines that are fiber in bulk form, and not the finer fibers you see in real military grade paracord. If they are not nylon sheathed, they are not Mil-spec and shouldn’t be relied on for hold weight of any kind as the elasticity may not be there with other materials. If not a military specification, you do not know how it will function or behave. Make sure it smells like clean materials if you cannot see the inside. True paracord will not rot or mildew like cotton or cotton blends that have been subjected to moisture and you can tell by smell. This means they very rarely have spotty pigmentation or spots on them. It should be a true rich color, and the same color throughout the sheath. No bleeds or blowouts in color, as that means poor dyeing in batches. Again, not mil-spec. Is there anything paracord should not be used for? The one specification is that paracord not be used for tourniquets. 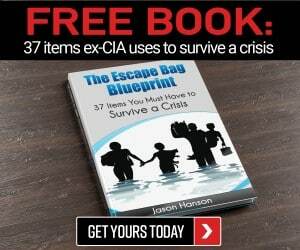 Its fine grain will crush the tissue without stopping bleeding, according to the Boy Scouts of America books. 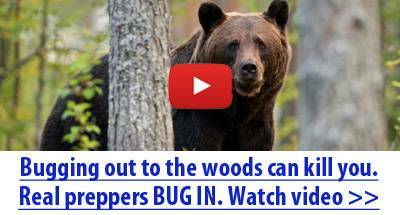 They used paracord for survival and many crafts, but recommend avoiding using it this way.